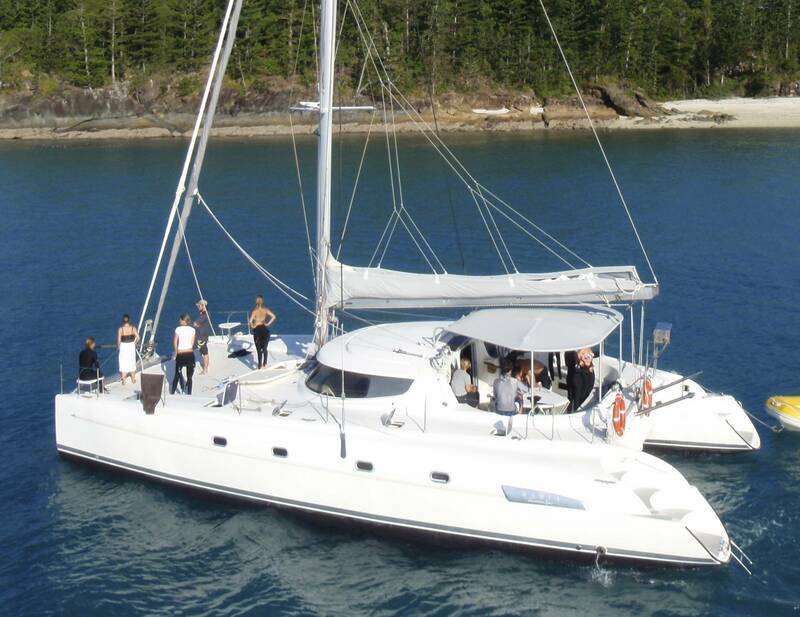 We are now offering two identical catamarans for sailing adventure tours in the Whitsunday Islands National Park. “On Ice” and “Entice” are built by the world renowned Fountaine Pajot shipyard and are sleek, comfortable, safe and spacious. 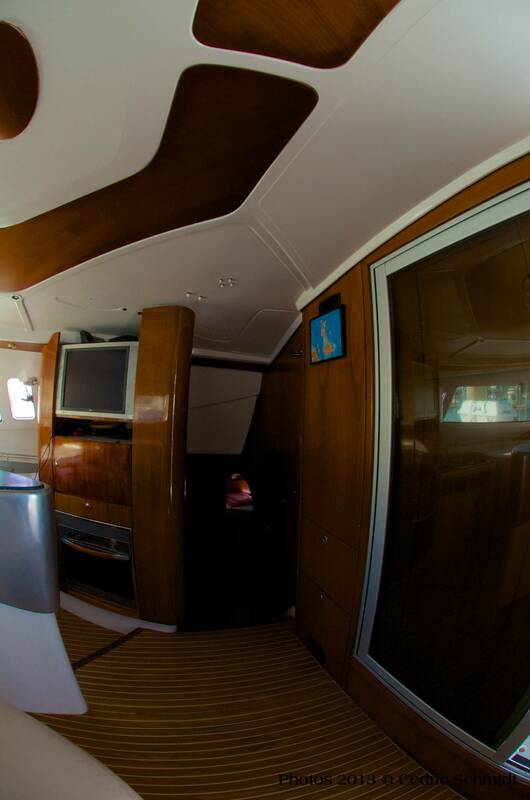 The Lounge area is super comfortable and features large panoramic windows allowing you to enjoy the scenery while feasting on the fabulous creations served up from the galley. On deck guests can choose to experience the excitement of sailing on the front nets or be more protected in the shaded back area. 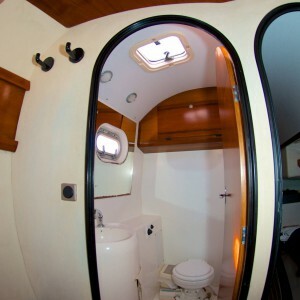 Guests travelling in groups of 2 or 3 can opt for the comfort and privacy of our private double cabins with own ensuite. For solo travellers or those on a budget, our shared accommodation allows people to experience a great adventure at a lower price. 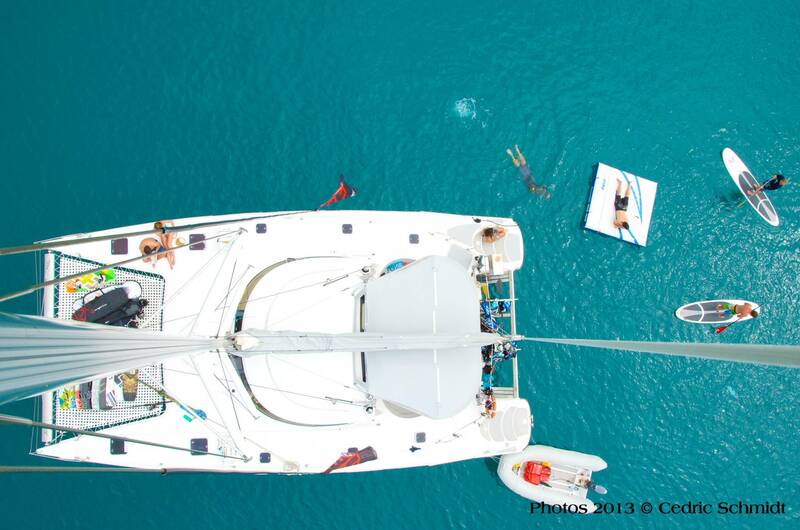 As an added bonus Entice catamarans carry an array of the latest water toys. 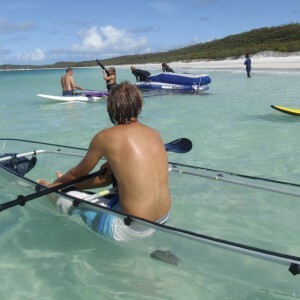 You can explore the calm bays of the Whitsunday Islands on a Stand-Up-Paddle board, stay dry whilst seeing some reef in our clear bottom kayak, float around on our sea lounge or even cruise through the water in James Bond style on our sea scooter. 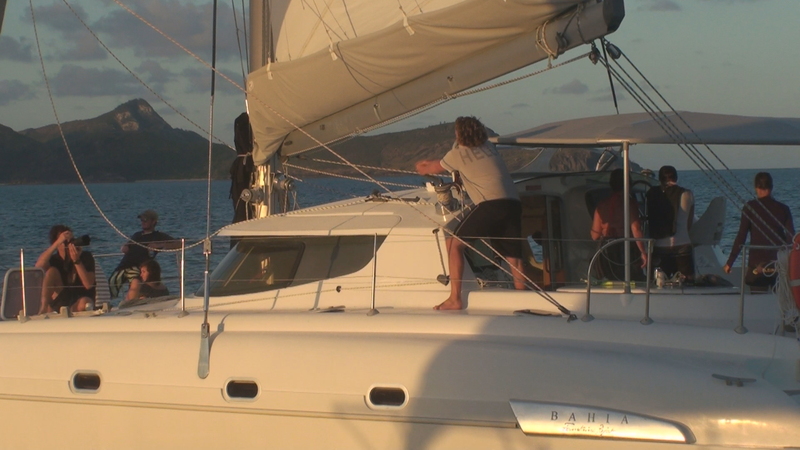 One Entice Catamaran departs daily at 4.00pm from Airlie Beach and returns after 46 hours at 2.00pm on the 3rd day to Abell Point Marina Airlie Beach. 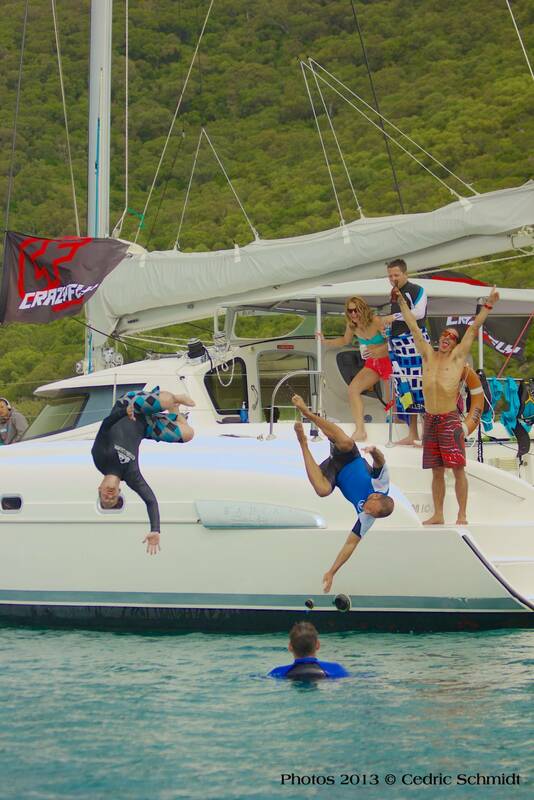 Why People Choose Entice Catamarans ? 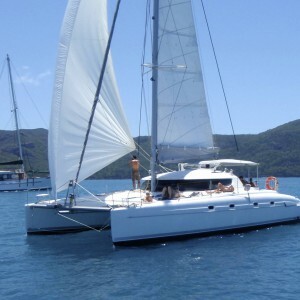 Entice Catamarans specialises in small group nature experience which are both relaxing and fun. 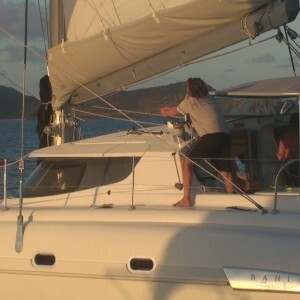 They sail the Whitsunday Islands with a maximum of 10 guest over 3 days covering 2 nights. 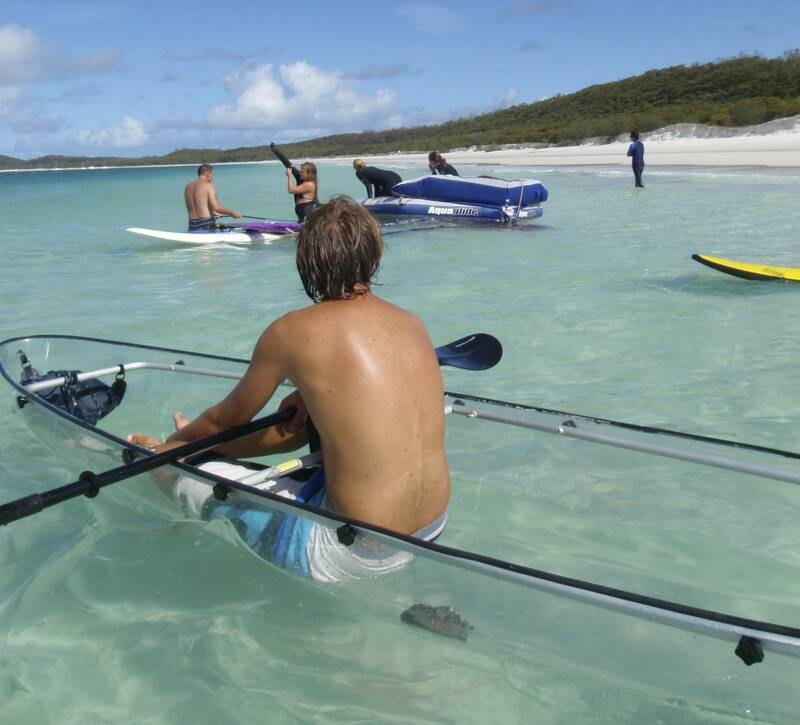 Each tour gives you the highlights of the Whitsundays in a personalised casual atmosphere aboard quality boats. 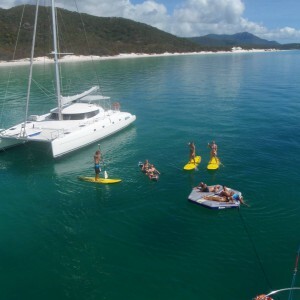 Enjoy epic scenic sailing, Whitehaven Beach, the Hill Inlet Lookout, amazing wildlife and snorkelling. These tours are designed for discerning adventure travellers who are more interested in collecting unique and memorable experiences than partying or mass tourism. 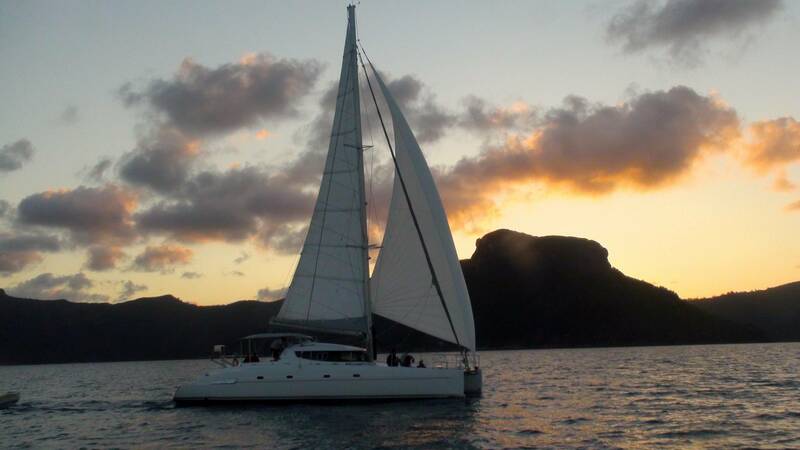 Entice Catamaran tours are equally suitable for ‘young’ single travellers as well as couples, families with adult or teenage children, fit young-at-heart travellers or anyone more interested in nature, activities and lasting memories rather than speed tripping. 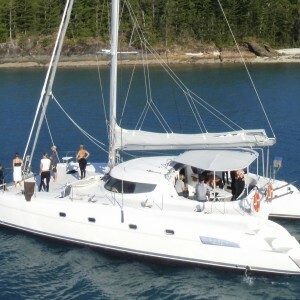 The owners of Entice Catamarans are a family owned company. 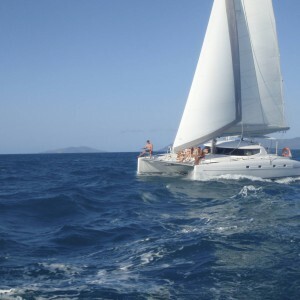 We are all passionate sailors who are here because we love the water and the Whitsundays Islands. 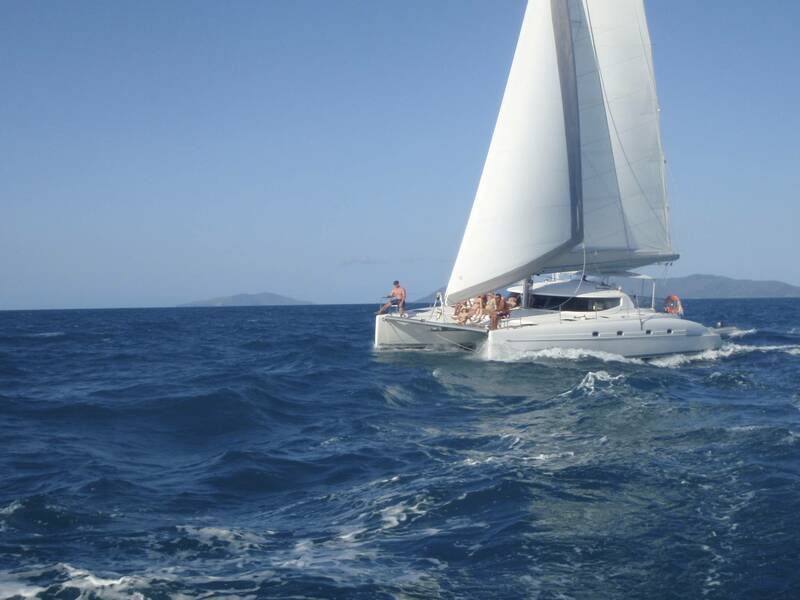 A quality ‘small group two night sailing tour’ is one of the best ways to explore the magical Whitsundays. The islands deserve much more than a quick visit to some highlights. 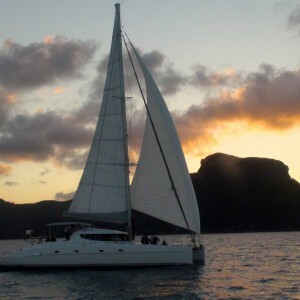 Sailing into the sunset, dining under the stars, enjoying a morning coffee watching turtles coming to the surface, getting to know new people and experiencing moving under the power of wind alone are all things which should be experienced at least once in a lifetime. 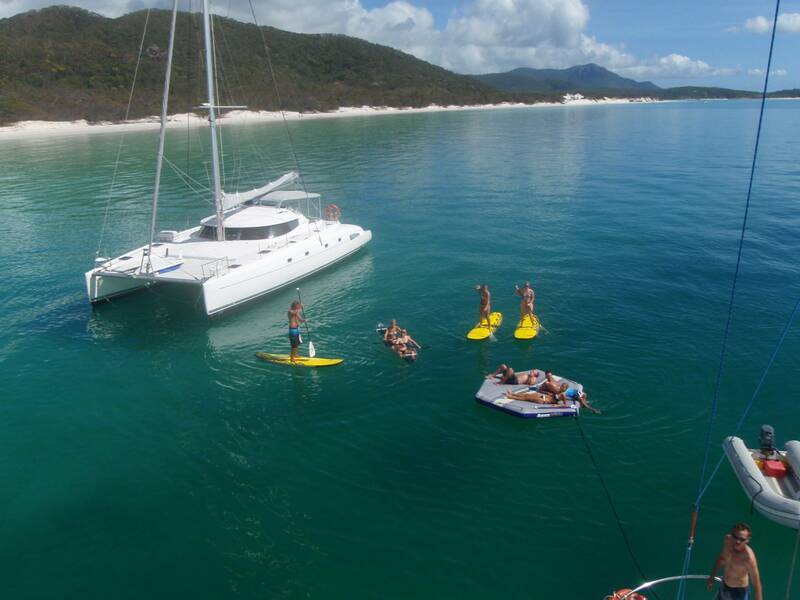 On Ice and Entice are Bahia 46 luxury sports Catamarans that are based in the Whitsundays in Airlie Beach and is available for either private charter or for 2 night scheduled ‘by the cabin’ cruises. View the On Ice/Entice Catamarans Charter Brochure On Ice A4 Brochure 2017. 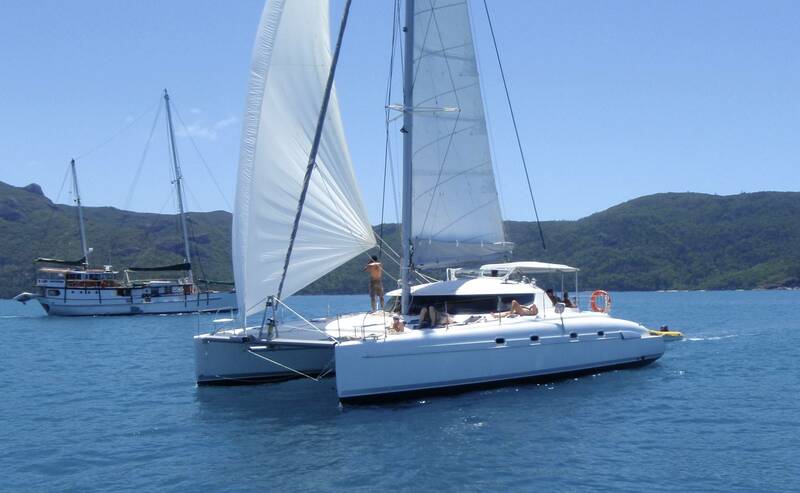 Both Catamarans have four double cabins and four showers plus a deck shower, and can cater for a maximum of 10 guests at one time. 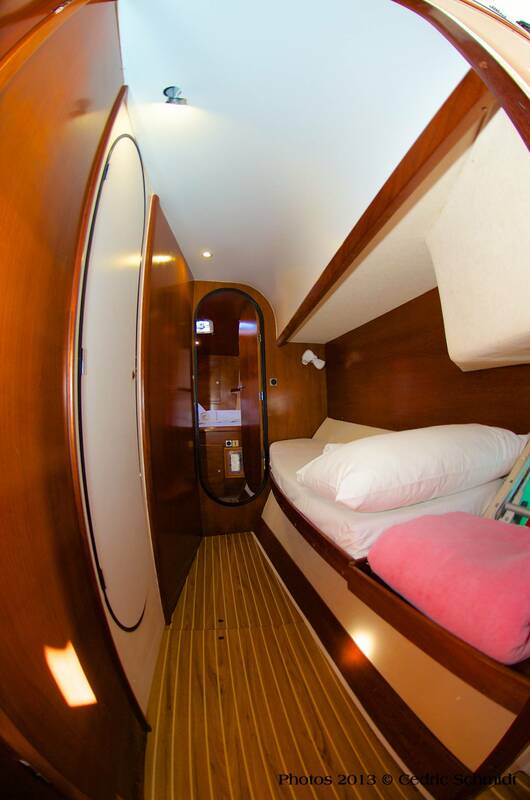 Her huge foredeck is perfect for relaxing while the yacht is under sail. The aft deck is protected from the weather so you can escape the elements without having to move indoors. The saloon features large panoramic windows allowing you to enjoy the views while feasting on the fabulous creations served up from galley. For easy access to the water, each hull has wide steps leading right down to the ocean. Our small group numbers allow you to visit pristine locations within the marine park, seeing the best of the Whitsunday islands whilst avoiding the crowds. The Whitsundays provide many amazing snorkeling locations. The colorful corals and most abundant marine life are close to the surface, so all one needs to do is put on a mask and snorkel to be amazed by the underwater world. Includes Beer , wine, soft drinks., lunch, afternoon Snacks. 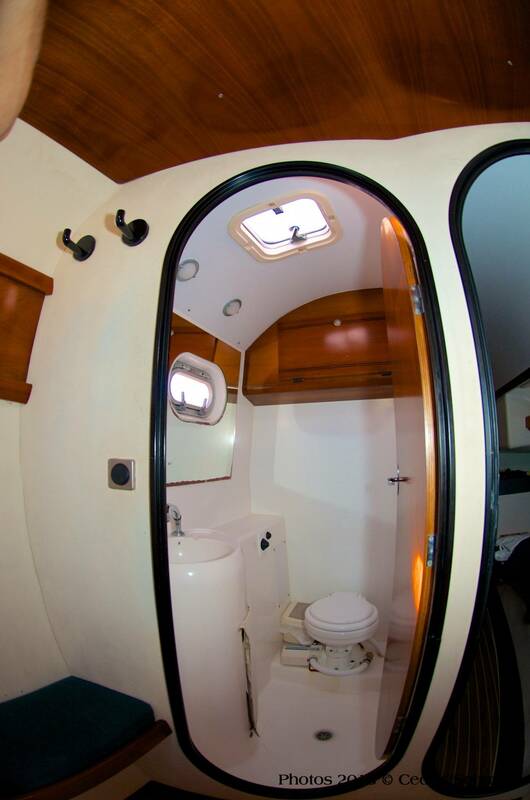 There are a maximum of 10 guests allowed on board and there are private ensuite cabins available. Prices for the 2 night cruises start from $525 per person based on a shared cabin or $679 per person based on a private cabin (with ensuite). $6,300 All Inclusive up until 31st March 2019. $6400 from 1st April 2019 onwards. $8,450 All Inclusive up until 31st March 2019. $9000 from 1st April 2019 onwards. $12,450 All Inclusive up until 31st March 2019. $12,800 from 1st April 2019 onwards. Departs Saturday or Monday at 4pm. $15,000 All Inclusive up until 31st March 2019. $15,500 also from 1st April 2019 onwards. 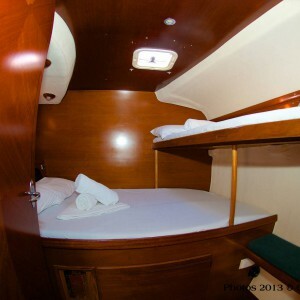 Prices include taxes, fuel, Marine Park Fees, wet suit, snorkeling gear, all meals, linen, professional Captain with 7 years of Whitsunday experience, professional hostess/deckhand, use of all watersports equipment, water, soft drinks. 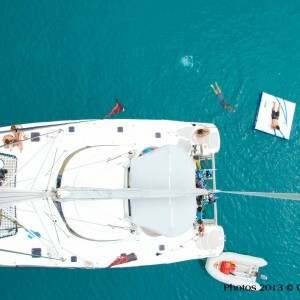 Extra costs include alcohol and rendez-vous diving (diving on private charters only). Contact us today to discuss your next luxury motor yacht charter in the Whitsundays. 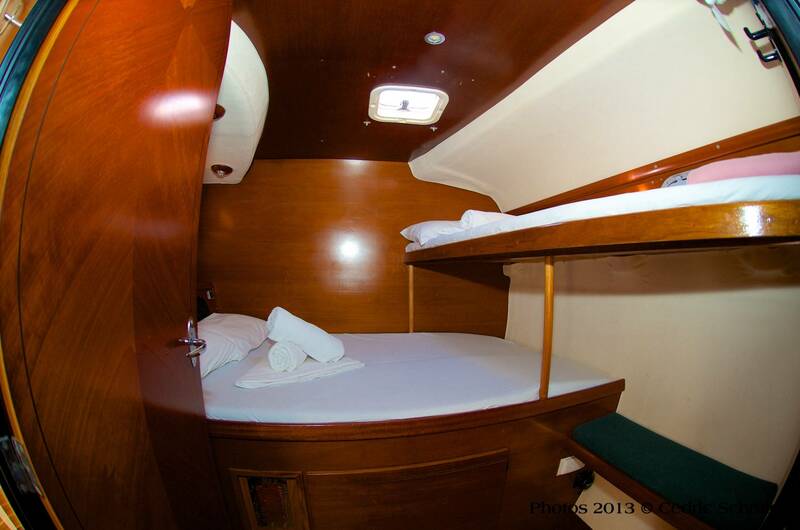 Or call our Charter Consultant direct on +61 (0) 434 214 446 – available 7 days per week! 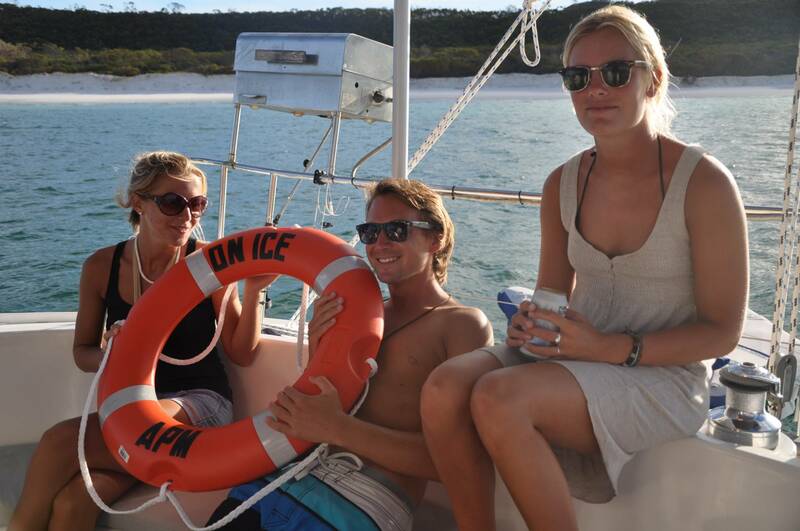 I just wanted to say how impressed and amazed we were with the Whitsunday boat experience. Pete the Skipper and Mitch just continued to blow us away and really made the trip so personalised and special for the whole family. The highlight of our whole two week trip around the East Coast was the boat trip and I think we all now have got the bug and want to do more sailing trips! I recently book a trip to Hamilton island and a cruise around the Whitsunday island with Whitsunday Holidays. I can not speak highly enough about the service they provided (in particular Clare) which was both professional and extremely friendly.